Dena Dale Crain lives on the shore of Lake Baringo, two hundred miles and a six-hour drive north of Nairobi, Kenya. She has a background in fashion design, textiles and consumer economics, and African art anthropology. She gives voice to these multiple interests as an art quilter. Dena’s work is often seen in joint and solo art exhibitions as well as in shops and galleries in Nairobi. Her commissioned works hang in Nairobi hotels and offices, as well as in private collections abroad. She helped found the Kenya Quilt Guild and continues to support its growth. She writes magazine articles about art quilting, and she lectures at both quilting and non-quilting functions. Dena is a Juried Artist Member of Studio Art Quilt Associates. She was for many years its Africa Zone Representative. Dena contributes actively to the organization's promotion of quilting as an art form. She established a global art critique service (SAQArtique) for its international members—the first of its kind for art quilters—and she participates in SAQA conferences, exhibitions and committees. 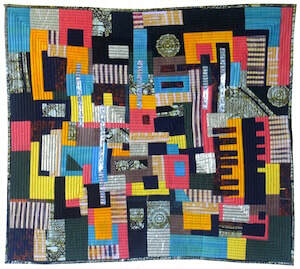 Teaching in Cape Town, South Africa, in 2002 moved Dena into the ranks of international art quilting teachers. She taught at such prestigious events as the International Quilt Festivals in Houston and Chicago, the Festival of Quilts in Birmingham, England, the European Patchwork Meeting, Quilt Canada, the US National Quilting Association, the Kuwait Textile Arts Association, New Zealand Quilt Symposia, the IQCAfrica and South African Quilters Guild Festivals, and at many other smaller venues in Australia, the UK, Canada and the USA. Dena successfully taught online patchwork quilt classes for Quilt University until it closed in 2013. Dena is recognized by the South African Quilters Guild as a certified quilt judge. She also judges online art exhibitions such as the United Nations children’s art festival Art for Peace and the Visions Art Museum’s Interpretations: Celebrating 30 exhibition.